The first thing that you notice when you pick up this, the fourth volume in the Potter saga, is that it's more than twice as thick as any of the previous Potter books. The first thing that you notice when you start reading it, is that it doesn't start of like the other books, with Harry living with the Dursleys. Instead we get a bit with you-know-who and his struggle to… regain himself. This is scary stuff! Rowling is wandering of the path that worked so well in the first three volumes. Has Rowling been overtaken with 'word bloat' as it happens to so many authors when they have had a few successes? Not really - not the malignant kind anyway. 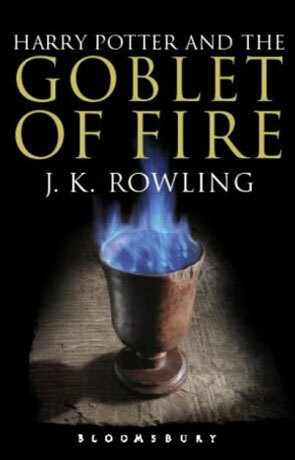 Firstly “Goblet of Fire” has a more generous line spacing and a bit larger font then the earlier books, which explains about 15-20% of the size increase. It also makes the book easier to read. Secondly Rowling has matured a bit and upped the complexity a bit, both Ron and Hermione gets to develop their personalities, making them move a bit out of Harrys shadow. It’s still a first person narrative told from Harrys point of view, but you can easily feel Rowlings urge to bust that seam. I wonder what volume five will bring us. We soon return to Harry at the Dursleys, but only just in time to catch him before he leaves for the Weasley (Rons family), where he’s going to spend the last we weeks before the return to Hogswarts. Soon there’s a new deadly threat against Potter – or is there? Well, you know there is, but this time it’s a lot less heavy handed. Harry has a more immediate task at hand, which in it self caries most of the story. I’m again immensely impressed, this is the best Potter book yet and I actually read the last three hundred pages in one sitting. Not something I often find the time for these days. I especially loved Rowlings description of the press – why should it be different from what it is like in the real world? Written on 21st March 2002 by TC.